CLICK HERE AND CLAIM YOUR RIGHTFUL PLACE AS A SUPER-SUPPORTER OF CLEVELAND! You might not know how crucial your support is to this small business community, but we want you to feel our love, our gratitude and make sure you have ways to tell your loved ones how you (yes, you!!!) are a part of Cleveland’s Creative Revival! If you’ve found yourself wondering WHY we ticket Holiday Flea (and charge you to get in the door at the normal season of the flea) this is for you. First, here’s what people tell us, which feels sooooo darn good. You help us create American jobs and pay a fair wage to our employees. You make the dreams of so many Clevelanders possible. Starting a small business is scary and tough and sustained support is required. Because we’re a monthly market, we offer that, and you help us maintain that. You show us that our work is seen. We (Team Flea) works so hard behind the scenes and most of our focus for you is on these stellar small businesses. Which is fine! But it can feel pretty thankless, because we’re mostly solving problems. Lots and lots and lots of problems. So, getting a dollar or 2 or 5 helps us track our own success beyond just the great feelings we get for being this partner for creative business owners. You love us. You get us. You want us to continue. Truly, that’s what it feels like. It feels like we are an integral part of this community. You love our business owners. You are invested in their continued success. You’re in this with us. You can’t imagine how hard this task really is, and to have you on our side means more than we could ever say. Truly. We are a small business. What? I know!! We have a huge task and a huge footprint but we’re a small biz just like those we support. The money we make from vendor booth sales does not cover the entire expense that it takes to be ready and prepared for a crowd of 10,000 people. It just doesn’t. And when you add to that all the fun stuff we do to keep everyone coming month after month (because long-term stability is a thing that small businesses require for success) it just doesn’t add up. Giving us $5, $10 or $20 is just like supporting vendors by purchasing their products, except that our product is the experience for you. Without your yearly support, we’d have to close our doors. It’s simple. If we can’t charge you, we will not be supported enough to continue our efforts in this community. We make shopping fun. We create a hospitality environment for you all. We also tell you about these businesses in creative ways, all of which are only paid for by you in very small ways. So, how much do you, the general public, contribute to us yearly? I’m not speaking about what you contribute to the vendors, and also THANK YOU FOR THAT, but what you contribute to us, Cleveland Flea. At the max, between all of our Holiday Markets, it’s about $34 per year. For us to continue to make this thing possible for all of us. Doesn’t seem like too much, right? That’s what we thought. But honestly, that money changes our lives, actually makes it possible for us to continue. We spend most of our money………..you guessed it, on you– our shoppers. On keeping you safe and creating an environment we know you’ll be comfortable within and coordinating with all these local business owners that we know you love and solving in-the-moment-crises that arise at any event that the show can, indeed, go on! If you really think about it, we do a lot together– you and us. You’re really a significant partner to us here at Cleveland Flea. And we just don’t think you know just how crucial you all are! Based on the questions we get, we are guessing you might not know the full story. And how could you? It’s a super complex business, this Creative Biz Incubator meets Maker Market meets Classic Cleveland Social Experience. It’s a really complicated business, and we’re darn proud we’ve made it into the powerhouse it is. But that’s also due to you. Our vendors AND shoppers. Here’s a list of questions we get around this time of year, and we’re happy to answer them for you all again! Q: Why does Cleveland Flea cost more than other local craft markets? A: Having MONTHLY events is taxing on us. We have a core team of 6 in house and we all work way too much as it is. Maybe if we didn’t do it 9 times a year, our staff wouldn’t be so damn exhausted. But if we didn’t do it consistently, we wouldn’t exist for small businesses when they need us. We’ve engineered stability into this market to encourage new business growth all year long. 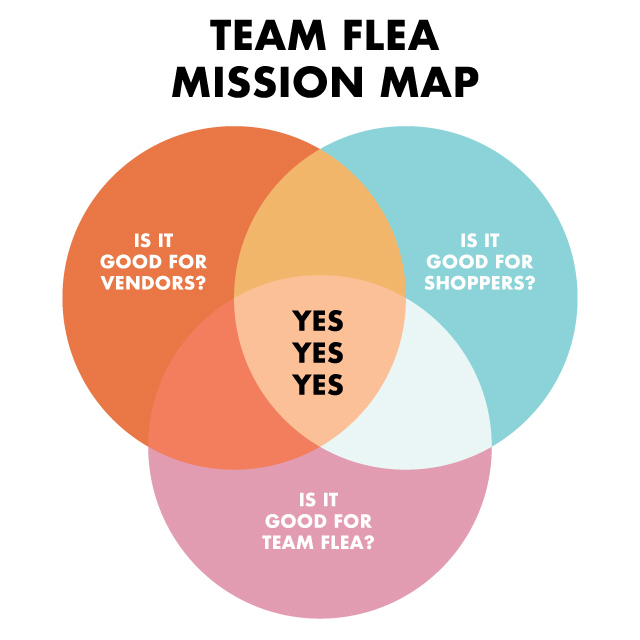 Because running monthly events of this size is so taxing on us, we have an entire day-of staff that we pay to help us make sure that the actual day of the flea goes off smoothly. But that costs money. And then you also need to take care of those people, make sure that they are safe and feel supported. Q: Why don’t you just get volunteers? A: We aren’t a nonprofit. So we don’t qualify for that. PS also volunteers don’t always show up when we need them, fully un-doing our efforts if we’re trying to take stuff off our own plates. You know that in your world, if you want something done well you’ve got to do it yourself. And that applies to us, too. Q: But why don’t you get support from the City of Cleveland if you’re doing so much to support our local economy? A: I ask myself that question all the time. Q: Why does it cost so much to run? Events are REALLY expensive. Lots of people are required to make this event work. Lots of safety precautions are taken, as well, to keep a large crowd happy and safe during the event. Because we have to be prepared for the worst, it just takes more money and time than if we only had to be prepared for sunny skies. You KNOW stuff always goes wrong, and we have to be fully prepared for that. Also, we’re not dealing with well-supported, well-funded businesses. They are busy and new and honestly not super prepared to be business owners. That means they require a lot of support (even if they don’t realize it) to help them get the most out of their day at Cleveland Flea. From coaching to helping pull permits to constantly solving mini-crises to sending the same information to them over and over again, it’s just a whole lot of work to keep new business owners on track. That’s how it’s supposed to be. They’re doing amazing, overwhelming, scary things, just like us. So, we do take the time to keep them organized, answer the same question 100 times and talk them through times when things seem just too hard. That takes time. Lots of time. If we were working with businesses that had enough support already, it wouldn’t be as time-consuming, but it also wouldn’t be that fun for anyone. We really love emerging businesses, but they’re a learning, growing community. Q. Why would I pay to go shopping? You’re not paying to go shopping. You’re giving us money for what we do– keep an emerging business pipeline open so that new businesses can form and make our city more creative. If you re-frame it, you’re buying from us. You’re supporting a bigger movement. You’re helping us make Cleveland a more creative place. $5, $10 or $20 keeps us going. To be very honest, without your support, we would have to close our doors. When you support US, you support the entire small business economy and the stability of it. Vendors can’t afford to fund us entirely, and we wouldn’t ask them to do that. Q. Why aren’t you a nonprofit? Q: Don’t I support you at the Flea Bar? A: The Flea bar operates under a nonprofit license. So, we’re not legally allowed to profit from the bar. We do charge a market fee to be there, but it barely covers the amount of time / work / physical setup that is required. And if the weather is bad and the bar doesn’t make money, we don’t charge the nonprofit so they don’t take a loss. For us, the bar is fun but it’s only an amenity to keep you coming AND a cool way to support nonprofits we love and flex our own creativity. Q: Why can’t you just charge the vendors a percentage of their sales? A: First off, I don’t think vendors would love that. Secondly, it’d be crazy hard to track. We’d have to put everyone on our own square/POS system and prohibit cash sales (to make sure everything is fair and accounted for). I guess it’d be possible but just not really probable and it would truly change the nature of our relationship with vendors. We’d want to make sure that feel good about it, and such a significant change would take a while to institute. Q: Why the different prices for Holiday Flea? To give you options, and also based on how much they cost to deliver you. Friday costs more (we have freebies for you all like entertainment, free food and fancier food / cocktails from vendors). To reflect your preferences. Some people want to give $20. Some of you want to give $5. To shift you around from Saturday-only to Friday and Sunday. If we left it up to you’d you’d just show up on Saturday morning and we’d get shut down. Q. Why else do you ticket, beyond just trying to support your efforts? A: To keep you all safe. We’ve got to cram 5,000+ of you into a space that holds 800 people at any one time. We don’t really want you standing out in the cold, truly. And there will be moments like that and we won’t be able to help you get warm. We’ll have to turn you away. And that is NO FUN. So, just help a team out and plan your visit early! Thank your for taking the time to read this, and thank you for supporting us. We LOVE you.